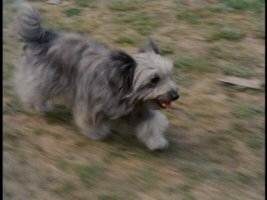 Greyfriars Bobby is based on the true story of a unique Skye terrier who affected a small town in Scotland nearly one hundred and fifty years ago. The film opens on Cauldbrae Farm in the year 1865. 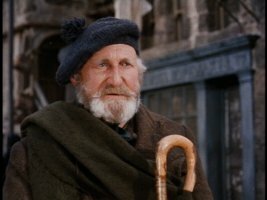 We are introduced to Jock (Alex Mackenzie), a very old shepherd who is taking off on a trip to the town of Edinburgh. He leaves behind his closest companion, a tiny dog called Bobby. thickly-muttonchopped gentleman who owns a diner that Jock frequents. Mr. Traill recommends that Jock sees a doctor and spends some time in the infirmary. Stubborn Jock refuses and instead finds some housing for the night, sneaking in Bobby against regulation. None too surprisingly, Jock dies in his sleep, an illiterate old man with a tiny Bible as his only possession. As no one seems to know his identity or family, he is given a private burial in Greyfriars Kirkland, a high class cemetery in Edinburgh. There was just one mourner at Jock's burial who knew the man: little Bobby, his faithful dog companion. Left behind, Bobby continues to show up like clockwork at the sound of the time gunfire for dinner at Mr. Traill's Dining Rooms in Greyfriars Place. Mr. Traill tends to the dog when he comes in for food. With no one to look after the terrier, the Greyfriars Kirkyard becomes Bobby's new home, as he seeks to stay close to Old Jock after his death. The dog's presence in the graveyard breaks protocol and the law. The cemetery's caretaker, James Brown (Donald Crisp), tries to shoo off Bobby. When he learns of Bobby's situation, Mr. Traill speaks on the dog's behalf, and tries to make James Brown let the terrier stay with his deceased owner. At first, Mr. Traill acts out of guilt, feeling somehow responsible for Jock's death. But after regular encounterings, takes a liking to the tiny, odds-defying Bobby, who braves the cold nights in the cemetery. Also forming a friendship with the dog are the poor, unfortunate neighborhood kids, who play around the cemetery and keep him out of harm from the Kirkyard's caretaker. Meanwhile, Brown's wife (Kay Walsh) also finds Bobby irresistible, and she has the dog stay with them, while her husband is set against not letting the dog trespass. Meanwhile, the town's police force bring a court case against Mr. Traill for harboring a stray animal, asking the restaurant owner to pay a seven shilling fee to license the dog. This sets up the final act, which brings in the Lord Provost as well as the children who have befriended Bobby. As described, the story may sound unusual, but it plays on film far better than you might expect. Greyfriars Bobby is a very old-fashioned picture, basking in the simple nature of its setting and the curious drama of its tale. Particularly in its first half, Greyfriars does not relent in providing bleakness and sadness. The first character we get to know gradually dies over the first-third and leaves a little adorable dog to fend all by himself. 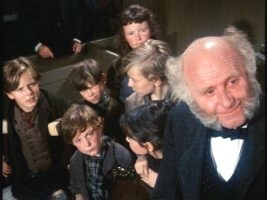 As the film progresses, a lighter story involving the principled Mr. Traill and well-intentioned poor children eventually emerges. Bobby remains the star, and his antics seem a forerunner to the '60s and '70s Disney films composed nearly entirely of an animal or animals as the driving forces of light comedy. Still, while the film manages to become somewhat infused with hope, it retains a solemnity and sternness that simply wasn't seen in the more popular and more "Disney" films of Walt's time. Younger viewers who are familiar with modern family cinema may very well not connect with the film so much. Its story would seem a bit above their heads, and most of the characters are old, distant, and tough to understand. Then there's the film's classical, leisurely pacing which may be off-putting to today's audiences. 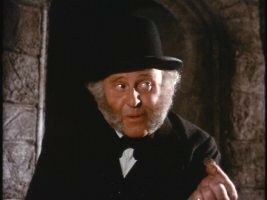 But Greyfriars Bobby is a curious film, and one which older viewers may find easy to appreciate. Had it been embraced, we might very well have seen more earnest, old-fashioned dramas and less spirited comedies like The Absent-Minded Professor and The Parent Trap, released earlier the same year and more favored by audiences both then and now. 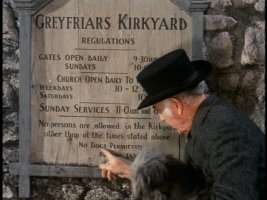 Not simply an animal picture and most certainly not a light Disney comedy, Greyfriars Bobby manages to engage with its unique tale, while not overwhelming the viewer in dreariness. Greyfriars Bobby looks worn-out and beat-up. The film looks its age and then some, as if it might have been made in the '40s. Yes, it is in color (albeit somewhat washed-out color), but looking at the film, it's tough to believe it was made in the same year as The Parent Trap. While the film's look may partly be an artistic decision, the video transfer shows wear and tear that would definitely not be intentional. The film is presented in 1.33:1 fullscreen, and it's tough to tell what that means, although by the early '60s, Disney was mostly using widescreen for its theatrical films. In some shots and most of the opening credits (which are merely boxed in to prevent names from being cut off), there seemed to be a bit of empty space at the top and bottom of the frame. However, other scenes seem to suggest that there would be no way to display the film with any bit matted, which would imply cropping here. 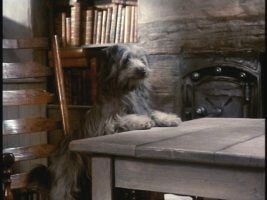 Whether the film is cropped or unmatted from its original aspect ratio, the video quality of Greyfriars Bobby will be disappointing to all but the least discernible of viewers. 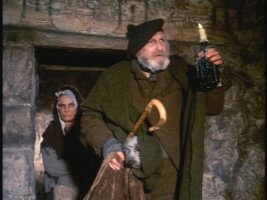 Maybe the film has never looked so good, but compared to The Three Lives of Thomasina (another film set in Scotland, which Disney made three years later, again under the direction of Don Chaffey), Greyfriars comes up very short. There's an excess of grain and a lack of sharpness. The print is riddled with flaws. Colors tend to be faded, but there are times when they bloom, such as the white of Laurence Naismith's shirt. There are times when the film looks acceptable, but there's a lack of consistency, and Greyfriars just never looks very clean or sharp. Presented in Dolby Mono, Greyfriars Bobby also shows its age in the sound department. The audio is at times muddled, and often difficult to decipher. That's partly due to the Scottish accents in the film, but mostly due to the sound elements in poor condition. The film is definitely in watchable condition, it's just that a first-time viewing will provide a challenge, though almost certainly no more a challenge than the previously released videocassette. 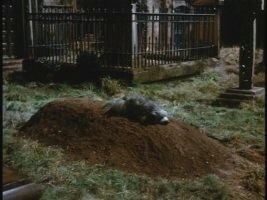 Still, I have no doubt that the video and audio quality for Greyfriars Bobby could be better, with a significant amount of work that must not have been put in. There are no bonus features included for Greyfriars Bobby. Menus are understated 16x9 screens, accompanied by selections from ye old-fashioned film score. The disc opens with a brand new 70-second preview for live action Disney films on DVD. This "Magic in the Memories" promo highlights some of the studio's more recently-released discs such as Follow Me, Boys! and the original Freaky Friday, in addition to family favorites like The Love Bug and Escape to Witch Mountain. The Shaggy Dog and The Shaggy D.A., two films which were originally intended to be released as extra-packed discs this August, are also briefly featured. Greyfriars Bobby is an unusual, but affecting film. Its animal cuteness predates films like The Ugly Dachshund and Rascal, but it is far more solemn and cold than most live action Disney fare. If you get this DVD, it would be entirely based on the film, as that's all there is on the disc. Audio and video quality leave a good amount to be desired, so you'll really have to be taken with this film from Walt's time to pick it up. If that's the case, you're probably glad that Greyfriars Bobby is finally on DVD at all.